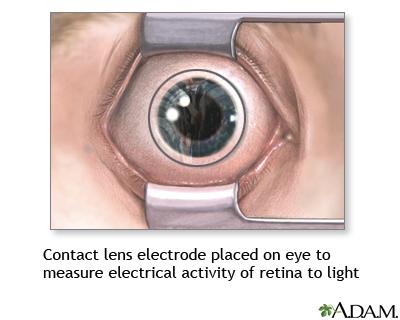 The electroretinography (ERG) test measures the electrical activity of the retina to light. It is performed by placing an electrode on the cornea of the eye after it has been anesthetized. Both hereditary and acquired disorders of the retina can be evaluated with this test. It is also useful in determining if retinal surgery is recommended.